NFI Research has compiled a list of the independent bookstores with the most Twitter followers. Powell’s of Portland comes in first, by far, with 9,880 followers as of October 13, 2009. New York stores dominate the list, and only one Bay Area store, Booksmith, even makes an appearance on it. This is a sharp reversal of the state of things earlier this decade when notable stores, such as Coliseum and Gotham, were closing in New York, while Cody’s and Book Passage were expanding in San Francisco. A revival of indie bookstores has taken place in New York over the past couple years with successful openings of Idlewild, Greenlight, and Word, among others. Cody’s did many things right. They kept an excellent stock, made new and unheralded books discoverable and desirable to their customers, and held great author events. I believe that they happened to be in a bad location on Telegraph and in a business that, with such slim margins, doesn’t do a particularly good job of weathering long downturns. When business and the weekend tourists abandoned Telegraph Avenue during the late 1990s and into this decade, so went the fate of Cody’s. I only spent a couple years living in Berkeley, but I went to Cody’s almost every day that I did live there, and I miss it terribly. In the BusinessWeek article Ross cites the figure that 10% of all copies of Walter Banjamin’s Illuminations sold in the United States were sold at Cody’s. This isn’t evidence of Benjamin’s obscurity, but rather the display of Cody’s brilliance in attracting its customers to a certain type of highbrow criticism. It’s that sort of intellectual rigor or forcefulness that you’ll never find at a store like Amazon or Barnes and Noble. Sure, they both carry Illuminations, but neither cares or pretends to care if you buy it or the latest Stephanie Meyer novel. And, in case you’re wondering, my copy of Illuminations came from Cody’s on Telegraph in 2002—Where else? Amazon has posted their picks for the 100 best books of 2008. The Northern Clemency by Philip Hensher claims the top spot. Honestly, I wasn’t planning to read this novel, but now I am. I find that one of Amazon’s most useful features is that it helps me discover new books better than most physical bookstores. And that, to me, is the value of a bookstore—how good a job it does of introducing me to books I didn’t even know I wanted. Every store will promote 2666, but how many will compel me to buy The Northern Clemency? Cody’s Books on Stockton Street in San Francisco will be closing on April 20, reports the San Francisco Chronicle. The 22,000-square-foot store on Stockton Street, between Union Square and Market Street, will close on April 20. It will send 20 percent of its inventory to the last remaining Cody’s location, on Fourth Street in Berkeley. Cody’s President Andrew Ross, who mortgaged his house to open the San Francisco store, said it has been losing $70,000 a month. When Cody’s Telegraph location announced its impending closure last spring, Ross asserted than the San Francisco store was doing quite well, and on pace to be profitable. Obviously and sadly, that didn’t happen. 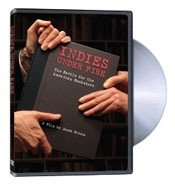 Indies Under Fire: better than the trailer? A few months ago, I posted about what was, at the time, an upcoming screening of the film Indies Under Fire sponsored by Kepler’s. Based on the film’s trailer, which I watched online, I wrote that it looked to be “another sentimental, corporate-bashing look at indie bookstores that refuses to do the hard work of pointing a critical eye at indies themselves and asking why the independent bookselling business has been stagnant and so incredibly slow to innovate or pioneer new business practices over the past few decades.” I recently received a comment from a reader who thought I might not have written that had I actually seen the film. I did attend the screening, and though the film is slightly more nuanced than I had expected, its implied argument is that Borders and the corporate booksellers led to the demise of Printer’s Inc. in Palo Alto. I grew up down the street from Printer’s Inc., and must note that it wasn’t a particularly good bookstore. When compared to the other big indie bookstores in the Bay Area–Cody’s, Kepler’s, ACWLP, Book Passage, Green Apple, etc.–Printer’s rated very low in my book. Independent booksellers link consumers with an identity that connects to a more differentiated self-concept, that fits within a narrower social group. Given the complementary nature of the relationship between these two organizational forms and the differentiated resources that they demand, branch store openings will not negatively affect the baseline survival rates of independent stores, even when they enter into the same community. In short, the relationship that Indies Under Fire suggests between Borders and Printer’s Inc. is flat out wrong. Printer’s Inc. killed itself. While chain stores were already a presence by World War I, changes to the federal tax code in 1954 turned them into tax shelters. Within three years, new shopping center construction had increased more than 500%; Wal-Mart, Target, Bradlees, Kor-vettes, and Caldor are among the retailers that soon appeared. These days, local governments lure the chains with generous subsidies and tax breaks, thinking the stores will bring jobs to town. 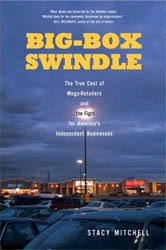 Mitchell, building on her own and others’ research, counters that the boost “is nothing more than an illusion.” The stores do create hundreds of jobs, but eliminate just as many by forcing other businesses to downsize or close. The tax dollars they generate are offset by lost sales and property tax revenue from local business districts and shopping centers. A 2006 working paper by the Public Policy Institute of California examined several markets and found the opening of a Wal-Mart resulted in a drop in countywide retail earnings of 2.8%. Coliseum Books in New York will be closing before the end of the year, according to the New York Times. I lived in New York when Coliseum reopened in 2004, and it was my third-favorite store in Manhattan behind Gotham Book Mart and St. Marks Bookshop. As reported in the Oakland Tribune and elsewhere, the Berkeley City Council has approved a plan to revitalize Telegraph Avenue. This action seems to be largely in response to the impending closure of Cody’s. However, David Lazarus expresses skepticism about the City Council’s plan in the San Francisco Chronicle. Lazarus suggests that the City Council is only working on a short-term fix, and he proposes the more radical idea of transforming the four-block stretch of Telegraph near UC Berkeley into a pedestrian mall. Andy Ross has been in talking with investors interested in saving the store. If you are a qualified potential investor, please email me. On June 8 at 7pm, there will be a community meeting in Berkeley to discuss the prospects of saving Cody’s. The meeting location is still to be determined. We will post any updates as they become available. Andy Ross will attend, and I encourage everyone to do the same. Do Bookstores Have a Future? Paul Collins asks this question in his Village Voice article, which is essentially a review of Laura J. Miller’s new book, Reluctant Capitalists: Bookselling and the Culture of Consumption. Today’s field, though, may not be the future’s. Superstores live and die by generous zoning, massive inventory, co-op money, and deep discounts. Zoning laws may stiffen, return policies change, or price controls curtail loss-leader strategies. All these possibilities, however unlikely, have precedents; indeed, it was the owner of Nantucket Bookworks who last month spearheaded a chain store ban in that island’s downtown. Ultimately, though, the greatest vulnerability of chains may be their muscle-bound nature. If print-on-demand technology, though still poky and faintly disreputable, ever achieves the availability and quality of traditional books, the need for overstock returns, remainders, and huge retail spaces may evaporate. Tyler Cowen has an article in Slate that makes the case against independent bookstores. I, of course, disagree with him on multiple counts, but his argument is well worth reading. Cowen seems to write from the vantage point of someone who has little interest in small titles or publishing houses. I’m willing to bet that his assertion that “if you’re looking for Arabic poetry you have a better chance of finding it at Barnes & Noble than at your local community bookstore” isn’t based on personal experience with a niche interest. What’s disturbing about the essay, though, is that Cowen blindly accepts the decreasing attention span of Americans. It was easy to finish Tolstoy’s War and Peace when there were few other books around and it was hard to find them. Today, finishing it means forgoing many other options at our fingertips. As a result, we tend to consume ideas in smaller bits, a proposition that (in another context) economists labeled the “Alchian and Allen theorem.” Long, serious novels are less culturally central than they were 100 years ago. Blogs are on the rise, and most readers prefer the ones with the shorter posts. 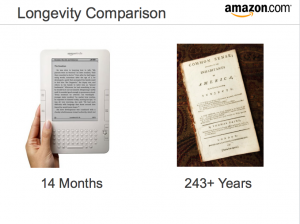 Our greater access to books also means that each book has less time to prove itself. A small percentage of the books published account for a large share of the profits, thus setting off a race to track reader demand. Somehow, people still read War and Peace and Anna Karenina and even some long books published in the last 50 years: The Recognitions, Infinite Jest, and Gravity’s Rainbow to name a few. Perhaps, Mr. Cohen isn’t aware of this. Cohen seems all too willing to accept current trends; perhaps, it’s because he isn’t actually a reader because readers, serious readers, are defined by their willingness to question what is normally accepted, to stand in opposition to the zeitgeist and say, “Everyone thinks this is good, but it’s kind of bad” or the inverse. Of course, Cohen is correct in his implication that if independent bookstores are reacting to the cultural climate rather than creating it, they will most certainly be doomed. There is the possibility that Cohen actually has read Tolstoy and Pynchon and Foster Wallace, and he’s just making big generalizations for the sake of being provocative. If so, it’s a shame because writing, as anyone who’s ever read those authors knows, can express deep moral ambiguities and raise difficult questions that go unresolved. In other words, it can do so much more than Cohen demonstrates in his essay.